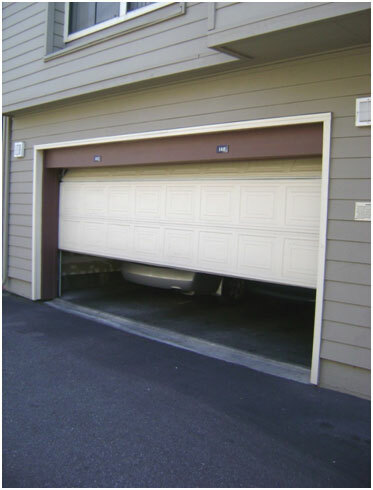 With winter on the way, it’s never been more important to make sure your garage door is working properly. Garage door malfunctions during the cold, rainy months can cause interior flooding, increased energy bills due to heat leaks, and make your home vulnerable to security threats when the sun sets earlier than at any other time of year. If your wall switch is malfunctioning but your remote works fine, you may need to either replace the wall switch or the switch wires. In order to determine whether it is the switch or the wires that are having issues, you will need to unscrew the switch from the wall and touch the two wires together. For those of you with safety concerns, fear not: these wires carry a very low voltage and won’t create a shock. If the opener runs when the wires touch, your switch is no longer working. You have two options in this instance: insert a doorbell button, if your opener is an older model, or purchase a new switch if necessary that is fitted with a light and locking option. If you find that the opener does not run when the wires touch at the opener, you can use a small wire to jump the two wires located at the opener terminal. If you find that the opener runs, the wire that connects the opener to the switch is causing the issue. If the opener does run, the wire connecting to the opener to the switch is causing the problem. The staples holding the wire to the wall may be pinching it, causing the circuit to short. Installing an 18-to-22-gauge wire can help with this. If the wall switch works but one of the remotes does not, batteries may be the culprit. If you have replaced your batteries and are still running into a problem, purchasing a new remote may be necessary. If you cannot find the proper model online, consider a universal remote or look into installing a new receiver. New receivers replace the radio frequency with the opener’s own frequency, and will automatically update an older opener to the new rolling code technology. All this can be accomplished by plugging the new receiver into an outlet close to the opener and running the two provided wires into the wall switch. If your garage door opener is malfunctioning and the above scenarios do not apply, it may be time to call a professional. Ponderosa Garage Doors and Repair is always here to help. Call us today!